Home Blog2 testimonials October Special: Pink Up! We encourage you to educate yourself and those you love about the importance of detecting breast cancer early and regular check-ups. 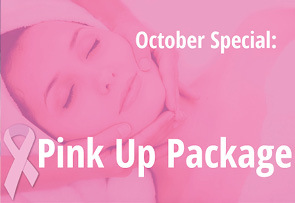 For this month’s special, we are offering the Pink Up Package. As we begin to see pink all around our area, we feel it’s fitting to offer this package and do our part to support the educational effort. 10% of our Pink Up Package proceeds will support Dig for Life and help the Saint Francis Medical Center Foundation provide free mammograms for local women who otherwise cannot afford them. Contact us today to take advantage of this package. We look forward to pleasing you soon! Do I Really Need To Exfoliate? What Booster is right for you?